(L-R) Glen Morgan, Nathaniel Jang, Parsa Moeni and Fitsum Zewdu are keen Night Hoopers. A procession of teens, all boys on the cusp of adulthood, flows into the Edmonds Community School gym in Burnaby. It’s Saturday night and they’re here to play basketball. They crow and strut, make their rounds of high fives, and call out to one another: Yo, yo – Number One – Let’s do-oo this. One of them, Glen Morgan, is in grade 11 and like all guys his age he says he never gets scared. At the edge of manhood, fear, like vulnerability, needs to be squashed or, at the very least, silenced. 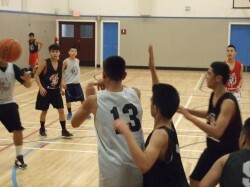 But not so long ago, as part of the Night Hoops Senior Boys’ basketball roster, Morgan’s team played at the Burnaby Youth Custody Services Centre. That place scared him. Night Hoops teaches youths the importance of cooperation and inclusion. Fifteen seasons later, the program has evolved. While preferred placement still goes to those referred by a social services agency, a broader range of youth are involved, not just those living on the edge, and there is also a girls’ league. At Edmonds, a large number of the players are African refugees. 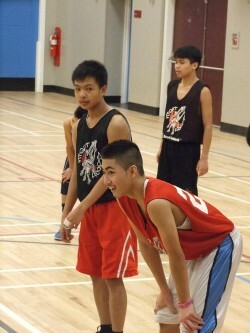 At Britannia High School and the Aboriginal Friendship Centre in East Vancouver there are many First Nations players. In Kerrisdale, it is largely Chinese immigrants. Chad Cowles, program coordinator for Night Hoops, says the league helps integrate these youth into the community, socially and in terms of language. Despite the changes, the program’s core values remain the same. Night Hoops uses the power of sport to provide opportunities for personal growth. What makes it unique is the virtuous circle it creates. Not only does Night Hoops affect the youth it was started to help, it transforms coaches, referees, and board members. 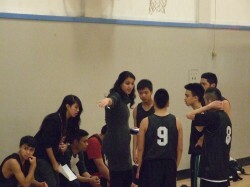 Rajbir Sohal, who is studying education at UBC, coaches the Trout Lake Junior Boys team. Tonight, in advance of the Junior Boys’ Edmonds versus Trout Lake game, coach Dean Valdecontes facilitated a workshop on personal hygiene. As a pilot project this year, these life skills workshops, which have always been part of Night Hoops, take place in advance of games and are delivered to both teams simultaneously. “We want to breed unity in the players,” says Cowles, the program coordinator. “Like we are all a part of Night Hoops, not competing teams.” Topics have included drug addiction, sexual health, nutrition and immigration. Rajbir Sohal, who coaches the Trout Lake Junior Boys, says she gets ideas for workshops from her players. Over the six years she has been involved, Sohal has, upon request, delivered many career development and resume workshops. 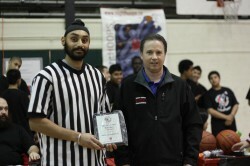 Inderjit Waraich received the 2011 Outstanding Referee of the Year Award. Inderjit Waraich, who has been a coach as well as referee over the five years he was involved with Night Hoops, says that as a coach he learned to let his players make mistakes. “Fortunately, on the court the worst mistakes aren’t that bad,” says Waraich, who recently joined the Vancouver Police after completing a Human Kinetics degree at UBC. For Waraich, the greatest gift of Night Hoops is watching the players mature over time. “Number 24,” says Cowles, as the buzzer goes for the Junior Boys’ game, “– he needs some shoes.” And he makes a note to grab a pair of high tops from his trunk. “They give us everything for free,” says Jang. From coaching to jerseys, food and shoes. “The only thing we got to learn,” says Morgan, “is if they say come eight o’clock, we got to be here.” “Yeah,” comes a chorus of voices. “Respect back,” they all say. “I think it is about giving back,” says Moeini, speaking up louder than the rest. “When I am 25 or 30, it is time to give back. It is not just about taking.” This is the lesson of Night Hoops. Pass the ball. Large-scale mechanical art is hard to ignore. Artist engineers are creating some head-turning pieces to provoke dialogue on human energy use. We are currently finalizing a Program Manual that will outline how to build the program in any city. The UBC Heat should come and play with our kids on our WFN rez!!!! !